After a learn-to-row class and a novice season, rowers are ready to join the competition team. Here, the Dayton Boat Club women’s eight celebrates after a race at the Indianapolis regatta in June 2017. Fairborn rowers on the team are: Marion Stout (third from left); and Vickie Schwab (second from right). The three-session on-water class, open to men and women, covers terminology, safety, stroke technique, equipment use and care, and sweep rowing in an eight-oared racing shell. Sessions are from 6-8 p.m. Friday, April 13; 9-11 a.m. Saturday, April 14; and 2-4 p.m. Sunday, April 15. The course is $100 per person, which is deducted from a rower’s seasonal dues if he or she joins the novice team following the course. Each participant should wear comfortable but not loose-fitting exercise clothes and bring a water bottle, a pair of socks and a small towel. For information or to register, see http://www.daytonboatclub.org/adult-learn-to-row.html . Dayton Boat Club is part of Dayton Regional Rowing, the nation’s only Community Olympic Development Program for rowing. https://www.fairborndailyherald.com/wp-content/uploads/sites/50/2018/02/web1_DBC-SPRING2018_PS.jpgAfter a learn-to-row class and a novice season, rowers are ready to join the competition team. Here, the Dayton Boat Club women’s eight celebrates after a race at the Indianapolis regatta in June 2017. 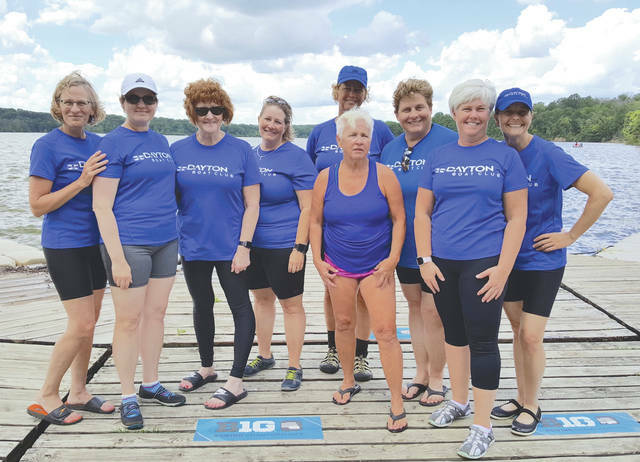 Fairborn rowers on the team are: Marion Stout (third from left); and Vickie Schwab (second from right).